The 2016 fall legislative session has ended, capping Governor Wolf’s first two years in office. Working with Republicans and Democrats alike, the governor has achieved significant progress on issues that have confronted the commonwealth for years, and in some cases, decades including historic education funding increases at all levels, a fair funding formula, expanding access to health care, fighting the opioid and heroin epidemic, modernizing the sale of liquor and beer, and legalizing medical marijuana. In his first two years, Governor Wolf has worked hard with Republicans and Democrats in the General Assembly to modernize the sale of liquor, wine, and beer in Pennsylvania in order to bring the commonwealth’s wine and spirits system into the 21st century. During the fall session, the governor worked with lawmakers to approve the sale of six-packs of beer at distributors throughout the commonwealth. This legislation further enhances the customer experience by providing greater convenience and satisfaction to the residents of Pennsylvania. Governor Wolf worked with both parties in the legislature to finally pass a long-term solution for ride-sharing companies like Uber and Lyft to operate everywhere in Pennsylvania. This legislation not only permanently legalizes ride-sharing, but it will also send two-thirds of the revenue derived from ride sharing in the city of Philadelphia to the Philadelphia School District to help the district continue to strengthen its financial footing. This funding is on top of the additional $97 million Governor Wolf worked to secure Philadelphia schools in his first two budgets. The governor and lawmakers from both parties also came together to pass a necessary and critical reform bill that will provide nearly 50,000 additional people with access to unemployment insurance. This agreement brought together both Republicans and Democrats, as well as advocates in the business community and organized labor, to ensure that we help the unemployed while they try to find work. This was also accomplished in a fiscally responsible manner ensuring we are good stewards of taxpayer dollars. 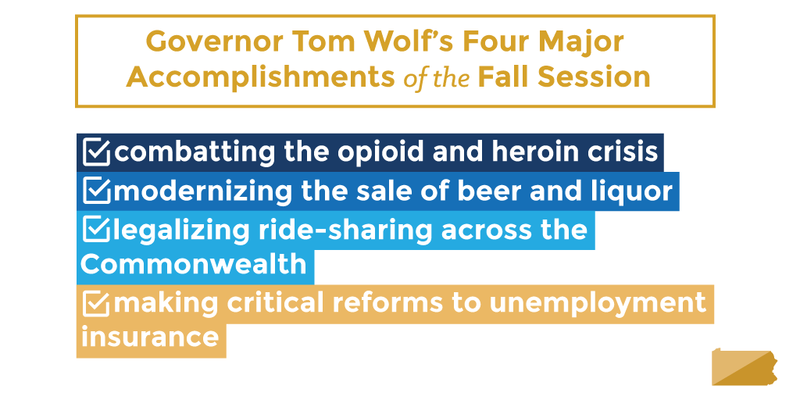 These accomplishments built on Governor Wolf’s successful first two years, and while we continue to move Pennsylvania forward, there is more work to do. Governor Wolf looks forward to continuing to work with legislative leaders and members from both parties to make Pennsylvania stronger.